The calendar has flipped to December and you know what that means. Parties. Lots and lots of parties. And while we all look forward to going out and having a good time with friends and family, it’s not always easy to think of a nice gift to bring the hosts. Until now. 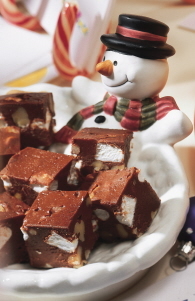 This week I’m happy to share the recipe for Rocky Road Cream Cheese Fudge, which, I have to tell you, is as good as it sounds. Featuring Canadian Cream cheese, this particular recipe has a lot going for it. Yes, it’s positively mouth-watering, but it’s also fast and easy to prepare, which is something you’ll appreciate during the holiday season when time is at a premium. Plus, it pairs extremely well with two bottles in particular. My first recommendation is a port called Noval Black. Made from traditional Douro grape varieties, its fig and raisin aromas really complement the fudge. And my second recommendation is the well-balanced and truly exceptional G. Marquis The Silver Line Vidal Icewine. Here’s to a magical December! Melt unsweetened chocolate; let cool slightly. Beat Canadian Cream cheese, softened and vanilla extract until smooth. Gradually beat in icing sugar and brown sugar. Beat in melted chocolate. Stir in miniature marshmallows and 1-1/2 cups (375 mL) walnut pieces. Press mixture into square 8-inch (20 cm) foil-lined pan. Cover and chill until set.